The Life insurance industry plays a major role in the Lebanese economy; noting that the Total life premiums generated in 2016 was US$498.64 million, compared to $471.09 million in 2015. Thus, the life insurance market grew by +5.8% in 2016/2015; whereas, Bancassurance recurrent premiums growth was +6.5%. BANCASSURANCE was ranked First bank insurer and second life insurer in terms of Life Insurance in the Lebanese market in 2016. 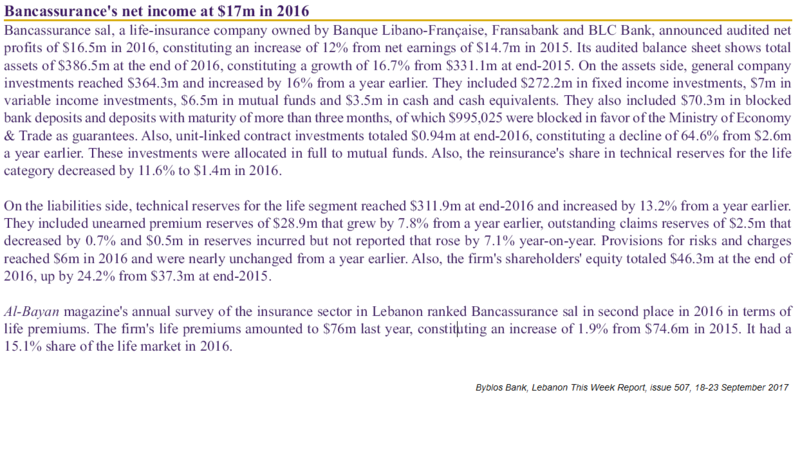 The top five life insurers in Lebanon accounted for 64.2% of the market in 2016 out of which Bancassurance share was 15.2%.